In sixth grade, Xenia loved furry animals, flying unicorns and technology. Even at that young age, she knew where she needed to focus her learning. When Xenia heard about the Capital One Coders program for middle schoolers at her local YMCA, she jumped at the chance to participate and build her skills by coding and developing apps. The need for coding programs continues to grow as only 35 percent of high schools teach computer science. The Bureau of Labor Statistics projects that between now and 2026, 58 percent of all new jobs in STEM will be in computing. That’s more than half a million jobs opening up across the next 10 years that will require knowledge of computing. Helping kids today learn the skills they will need in the workforce tomorrow is the charge of the Capital One Coders program, which is part of the company’s Future Edge initiative. Through Future Edge, launched in 2015, Capital One committed to help more Americans get the skills they need to succeed in the 21st-century. 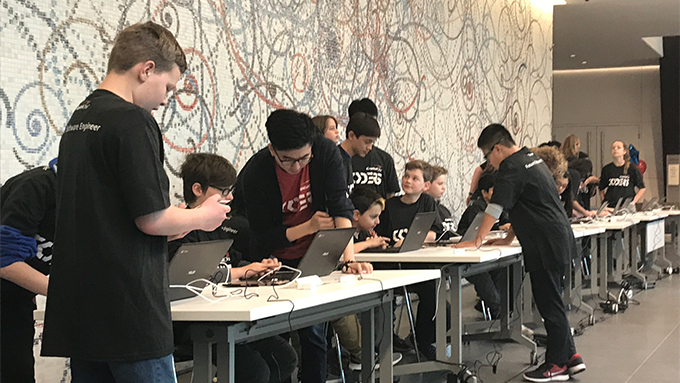 Capital One associates volunteer their time to teach middle schoolers about problem-solving, teamwork and the basics of software development across the 10-week Coders program. With hands-on experience building their own applications, students learn about coding, algorithms, loops and conditional statements. At the close of every 10-week Coders program, Capital One surprises participating students with a laptop of their own, so they can continue to build on their coding and technology skills. This gift provides important access to technology at home, which can have a huge impact on some kids’ lives. Since the program’s creation, Capital One Coders has partnered with more than 75 schools and nonprofit organizations, teaching approximately 9,000 students how to code. As of mid-2018, 2,500 associates volunteered 55,000+ hours for the Capital One Coders program. Capital One also invested $170,000 in Coders Continuation Kits at the end of the school year for school partners focused on providing resources for continued Technology/STEM education. At the end of Xenia's experience with Capital One Coders, she wrote a letter to her "future self". She said when she began she was excited, curious and a little nervous, but she loved the world that opened up to her. "With a background in coding, you can be whoever you want to be, she wrote to her future self. “I can't wait to see where you are now."